We are a young company from Koprivnice city in Czech Republic, where work mostly young people of different professions who have one thing in common- Love moving at heights and achieving goals which some people can consider to be extraordinary. Most of us do rock climbing and bouldering in our free time. And that's why we teamed up pleasure with usefulness. In 2003 we began to implement our ideas and established company based on a trade license and by the end of 2008 we become limited liability company- called CLIMB ON Ltd. In this way we want to express to our business partners that we succeed in fulfilling our goals gradually and we plan to expand and develop their further satisfaction. 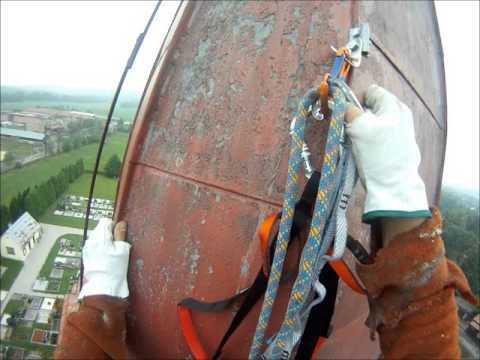 Our company is focused on the carrying out construction, painting, assembly and other work at heights, mostly using climbing equipment (i.e. without the use of scaffolding). Work carried out without scaffolding is usually faster and cheaper than with conventional technologies. However, if the work requires platform (i.e. repairing a damaged facades), work is done from the assembly platforms or scaffolding. In this trend, we continue to increase further productivity of our work. List of works shown on this page is only indicative overview of what we are able to provide. All projects in the field of work at height are to a certain extent the original, it would be tedious to cover them all briefly presentation. For the same reason, we deal with all orders individually and try to find the most suitable working procedures. Thanks to this approach we have so far managed to solve every problem. Check out the video in the link working procedures.